Welcome to this year’s second Newsletter for the Hepatitis B and C Public Policy Association. England continues to invest in effective and accessible community drug treatment and the number of adult injectors receiving drug treatment increased to 114,855 in 2010/11.¹ Amongst those who continue to inject drugs, sharing of injecting equipment and associated paraphernalia is the main route of transmission of infection. National surveys of PWID across the UK suggest that levels of direct sharing of needles and syringes may be falling; in the four weeks preceding surveys of this activity, reported levels of sharing were around 17% in England and Scotland.¹ Needle and Syringe Programmes (NSP) are being developed throughout the UK to help reduce these levels further. Current data suggest that whilst NSP are being accessed by increasing numbers of PWID across the UK¹, there remains a need to increase the amount of equipment distributed with better targeting of this provision. In addition to PWID, migrants from countries with a higher prevalence of HCV infection are at increased risk of HCV-related disease. In these cases, infection is usually acquired following non-sterile medical treatment in their countries of origin before migration to the UK, or vertically from an HCV-infected mother. Surveillance of infection in English blood donors, suggests that while levels of HCV infection in blood donors remain low, a disproportionately large number of infections are seen in blood donors of South Asian origin and in those of ‘other white’ backgrounds,¹ the majority of whom were born outside the UK, particularly in Asia and Eastern Europe. Raising both professional and public awareness remains a priority and is a critical component of reducing the burden of undiagnosed infection. Throughout the UK, a variety of initiatives are ongoing to increase public awareness of hepatitis C. These are specifically designed to target those at greatest risk of infection, including past or current PWID and individuals of South Asian origin. The success of these initiatives has been dependent on the significant contribution of numerous government and non-government organisations working across a range of settings with key stakeholders. In 2011, the UAM survey suggested that half of participating PWID in England were aware of their HCV positive status, which represents an increase from 42% in 2001.¹ Levels of awareness of infection have been relatively stable in Wales and Northern Ireland in recent years at 56% and 61% in 2011 respectively. In similar surveys of PWID in Scotland in 2010, among those who tested hepatitis C antibody positive, 44% reported that they had been diagnosed with hepatitis C and a further 12% reported having cleared the virus. At the end of 2012, the National Institute for Health and Clinical Excellence (NICE) published guidance to help ensure that more people at increased risk of hepatitis C (and B) infection are offered testing.³ By monitoring testing and diagnosis, we are able to assess the impact of awareness raising initiatives and prevention activity at a population level, as well as in sub-groups who are at increased risk of infection. In England, sentinel surveillance suggests that levels of testing have stabilised since 2008,¹ which may be the result of testing saturation among the pool of easy to access individuals and/or a reduction in awareness raising activity; a similar trend is observed in Northern Ireland. However, testing via primary care in England continued to increase year-on-year between 2008 and 2011, suggesting that awareness of hepatitis C may be increasing in this setting.¹ In 2011, more than 80% of PWID participating in the UAM survey reported ever having had a voluntary confidential test for hepatitis C.¹ In this important risk group, national data clearly show that alternative testing technologies, in particular dried blood spot testing, are continuing to contribute to the increased uptake of testing.¹ Of the estimated 39,000 people living with chronic hepatitis C infection in Scotland, approximately half were thought to have been diagnosed by 2011. In England, current government policy aims to improve public health outcomes across a locally-led system and to address health inequalities.4 Increasing the uptake of HCV treatment and care will enhance delivery in many policy priority areas, and will prevent premature death from chronic infection and associated liver disease. This will also contribute to a reduction in mortality from cancer and enable its early diagnosis, and reduce mortality from communicable disease (both also targets of recent government policy). More broadly, increased access to hepatitis C treatment services will help meet the policy vision to reduce health inequalities as this infection is known to disproportionately affect marginalised groups of society.¹ By increasing national levels of treatment overall, and broadening access to it, improvements in the quality of life will be observed for individuals with this long-term condition, helping them to recover from ill health and to have a more positive experience of healthcare. In England, between 2006 and 2011, an estimated 27,500 patients were treated with pegylated interferon and ribavirin as recommended by NICE;¹ Based on estimates of the HCV prevalence in England, approximately 3% of those chronically infected are treated each year. Recent surveys suggest that 78% of Primary Care Trusts in England now have treatment care pathways in place for hepatitis C, with many having specific provision for offenders and joint prevention plans with drug services.¹ In the prison estate, around three quarters of English prisons have written pathways in place to describe what happens following a positive HCV test result, with most prisons (86%) in 2011 providing follow-up for prisoners discharged into the community.¹ The model of hepatitis C treatment delivery varies considerably across the English prison estate with a combination of in reach services provided by local hospitals, treatment provision in house overseen by prison doctors, and hospital outpatient appointments. months after the initial confirmation. In Scotland, of the estimated 18,000 diagnosed individuals living with chronic hepatitis C in 2011, an estimated 26% attended a specialist centre in 2011. Between 2007/08 and 2011/12 more than 4,000 individuals had been initiated on antiviral therapy in Scotland. Action plans and work programmes have driven improvements in the prevention, diagnosis and treatment of HCV across the UK.¹ However, there is still much to be done if the morbidity and mortality from HCV-related liver disease that has been predicted is to reduced/averted. NHS reform in England poses a challenge to hepatitis C provision, particularly for those marginalised groups of society who are most affected by the virus, but it also provides opportunities for better co-ordination and integration of services. The future work to address this should not be underestimated as many infected individuals, including intravenous drug users and minority ethnic populations, are ‘hard to reach’ and service provision needs to be better tailored to be accessible to those who need it most. People will not remain ‘hard to reach’ if services are ‘easy to access’. Hepatitis C virus (HCV) was identified as the major cause of “non A-non B” hepatitis in 1989. Our health professionals and authorities promptly recognized the potential for the HCV infection to cause significant sanitary burden in France, and they reacted to this potential concern in a number of different ways (Fig. 1). First, an epidemiological study was conducted by our national institute of surveillance (Institut national de veille sanitaire, InVs), which evaluated the seroprevalence of HCV infection in the general population as well as at-risk populations. This study provided the health authorities with data necessary to make subsequent decisions from health authorities. Working closely with our national scientific association (Association française pour l’étude du foie) which we created in 1975, 30 reference HCV centers (university hepatology wards) were established and distributed throughout the country. Their mission was to coordinate public and private sectors for patient management and follow-up, train health care workers, develop treatment guidelines, and carry out clinical research, a task which was later extended to the hepatitis B virus (HBV) infection. The first national program against hepatitis was implemented in 1999 (1999-2002) and was exclusively dedicated to hepatitis C. Its specific goals were to reduce HCV transmission, increase screening of the at-risk populations and improve the access to treatment in infected patients. This was associated with a new epidemiological InVs study evaluating the prevalence and morbidity of HCV (and HBV), and the organization of two French HCV consensus conferences (1977 and 2002) to establish guidelines for appropriate investigation and treatment of the infection. The national program was renewed in 2002 (2002-2005 program) and extended to include the HBV infection. Within a decade, both programs permitted a marked improvement in the number of screened and treated patients. Progress made in prevention, screening and access to therapy seemed, however, insufficient, thus resulting in the development of a third program. 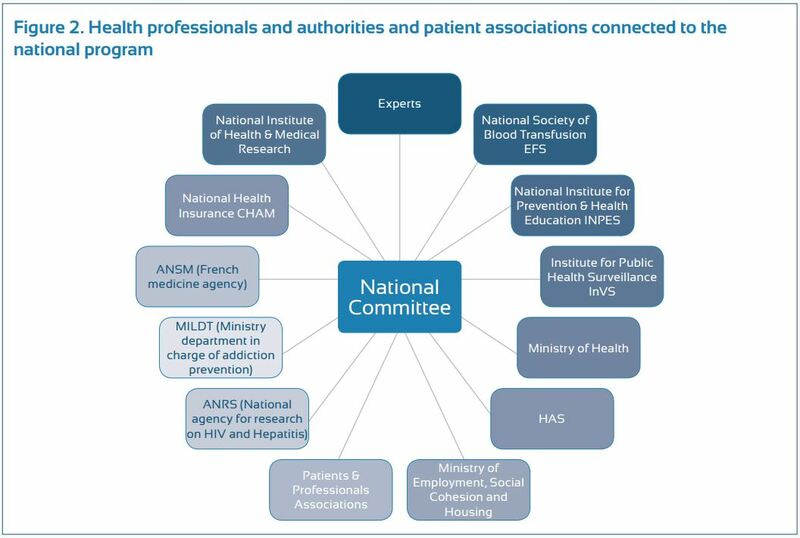 This program, initiated in 2009, was conducted by a national committee, which was composed of sixty members, representing all areas of HBV and HCV prevention, treatment and research (Fig.2). To improve reactivity and efficiency, a select committee of 15 members, including a full-time person specifically in charge of viral hepatitis at the French ministry of health, was elected to conduct more frequent follow-ups of the program. This program included five strategic goals (including a total of 55 actions) to: (a) reduce risks of hepatitis B and C , (b) develop new hepatitis B and C screening strategies, (c) improve access to health care and the quality of care for patients with chronic hepatitis B and C , (d) adapt the recommended measures to prisoners, and (e) reinforce research to improve epidemiological knowledge and comprehensive patient care. The program ended in December 2012, after successfully carrying out all the actions planned during its creation. Although residual weaknesses were identified, France was recently ranked first among 30 European countries in an independent evaluation conducted by the European liver patients association (ELPA) (Euro Hepatitis Index 2012 report). Major advances have occurred in the treatment of hepatitis B and C in recent years, and now with new therapies, these infections can be controlled (for B virus) and cured (for C virus) in 90 and 75% of patients, respectively. Our health authorities have been informed of these results and are aware that for infected people who are not screened and treated, this represents an unacceptable missed opportunity of care, both at an individual level and collectively. As a result, at the completion of our 2009-2012 program, the French minister of health proposed to reinforce the fight against these infections and asked a group of experts to develop new recommendations that could be implemented in upcoming years. About 400 million people are chronically infected by hepatitis B or C viruses worldwide, and one million individuals die annually from these infections. The World health organization (WHO), in deciding to include hepatitis B and C among their main health priorities, realized that hepatitis programs, such as those conducted in France, were only developed in a minority of countries, and proposed their large implementation worldwide. Connections are planned between the WHO and our health authorities to benefit from the WHO reflections and perspectives, and, if judged useful, to share our own experience of hepatitis programs with the hope to optimize future initiatives. Considering the impressive advances in the therapy of hepatitis B and C, compared to their devastating consequences, who can ascertain that these diseases do not represent an immediate health threat and that they should not be a priority? Be proactive (and efficient). It is not time to say goodbye. It is widely accepted nowadays that the needs of patients are of utmost importance in shaping public health policies not only because patients experience the heavy burden of the disease daily, but also because they are the most valuable source of information with respect to the effectiveness of treatment, policy measures and the areas of improvement in both fields. Therefore, it is only natural to expect that governments would pay due respect to the demands of patients. However, practice proves that this is not necessarily always the case. What seems to be a historic opportunity in this respect is the development of national hepatitis plans that are coherent and time-bound strategies to effectively address the disease. In this context, patients’ organizations play a key role in promoting and communicating the interests of patients to other social structures, namely, medical professionals and government officials. Patients are the best information source of the current situation in a country. They are in the situation to identify the gaps in the health care system and rank the problems. At the same time nowadays national hepatitis organizations are trained to be able to structure problems and to rank necessary activities. A government should not develop a strategy plan without involving the experience of patients and their knowledge in addressing problems. At the same time, patient organizations are in a network that makes it much easier to communicate and distribute parts of the strategy plan. In recognition of this fact, the European Liver Patients’ Association, (ELPA), took the leading position in placing patients at the centre of public healthcare policies throughout Europe by carrying out multiple projects and participating untiringly in various policy initiatives. In 2012, the European Liver Patients’ Association devoted enormous effort to conducting an in-depth research, the Euro Hepatitis Care Index, which aims to identify the national policies on hepatitis in terms of five key indicators: prevention, case finding and screening, access to treatment and process, patient involvement and national strategy and outcomes. On the one hand, this comprehensive tool assesses to what extent national governments are willing to address the hepatitis burden but more importantly, it exposes the discrepancies within Europe in terms of patient care and treatment. The ultimate goal is to encourage governments to employ good practices from countries which have achieved sustainable results in the fight against hepatitis and implement effective policies to prevent the spread of the disease and create possibilities for patients to benefit from quality treatment and care. The Euro Hepatitis Care Index proved to be an impactful instrument; as a result, a number of countries committed to the development of national hepatitis strategies (Bulgaria, Croatia, Greece, Italy and Germany). The development of national hepatitis plans is a crucial step towards the improvement of patient care in European countries by integrating patients’ needs and scientific advancement in a single long-term strategy reinforced by the willpower of policy-makers. The initiative for the development of national hepatitis plans is unique in essence for two reasons – firstly, it unites the efforts, but more importantly, the interests of multiple stakeholders – patients, community representatives, patient organizations, medical professionals and politicians; secondly, it functions as an exemplar, and in this sense, sets the standards in the non-governmental sector for successful collaboration between different social structures in pursuit of one cause – to eradicate hepatitis. To facilitate the process further and also to engage other countries in the process, ELPA, in association with the World Hepatitis Alliance and other key stakeholders, has undertaken the next ambitious task: to create a toolkit that analyses the existing data, identifies the best practices in identical circumstances and instantly provides a draft of a national hepatitis plan. This innovative project will reinforce the strategic goal intrinsic to the Euro Hepatitis Care Index – to implement effective prevention policies, to improve access of patients to innovative treatment and quality care and to strengthen patients’ advocacy. The development of a platform where national hepatitis plans are devised according to the specific needs of patients is another step in this direction as it ensures that the technical obstacles due to the lack of administrative capacity are eliminated as a reason for the lack of a national plan. This two-level approach that ELPA implements shows the urgent need to tackle the hepatitis threat decisively in order to improve the well-being of patients with hepatitis and inform society of the importance to hear and consider the needs of the most vulnerable in society – the patients.